No. 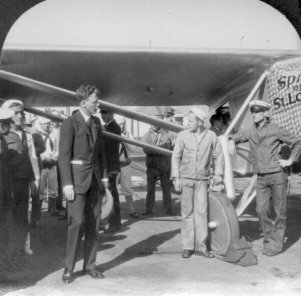 1062: Who Was Charles Lindbergh? Click here for audio of Episode 1062. Today, an aviator searches for his center of gravity. The University of Houston's College of Engineering presents this series about the machines that make our civilization run, and the people whose ingenuity created them. During decades of [flying we crowded ourselves into] cities that spread like scabs across the landscape. Obviously an exponential breakdown in our environment was taking place; and, just as obviously, my profession of aviation was a major factor in that breakdown. Aviation had opened every spot on earth to exploitation. That was far from Lindbergh's earlier thinking. He grew up in a small Minnesota town -- his father a progressive congressman, his mother a chemist who drew him into technology. When he was 11 she took him to Panama to see the new Canal being built there. Lindbergh tried to take up engineering, but he didn't have the patience for it. He flunked out. Then he enrolled in a flying school. Before he was 20, his heart was set on winning the $25,000 Orteig prize for flying from New York to Paris. Of course, he won the prize and the fame that went with it. By the mid-30s he was consulting in Nazi Germany. He was deeply impressed with Hitler's technocracy, even if he distrusted the politics. Back in America he preached defensive isolationism. When WW-II broke out, he offered his services to the Army. By then, they saw him as pro-Nazi, and they wouldn't take him. Historian Leonard Reich tells how Lindbergh went instead to industry. First he helped Ford make B-24 bombers. Later, he was almost killed test-flying a P-47 for Republic Aircraft. By the age of 42 Lindbergh was a "civilian" test pilot in the South Pacific. He combat-tested P-38s and Corsairs. He flew fifty bombing and strafing missions. He even shot down a Japanese plane. His work changed the tactics of low-altitude combat. After the war, he influenced the development of civilian jets. He also wrote a book of essays on the conflict he saw rising between the benefits and the dangers of modern technology. Lindbergh's defining moment came in 1955 when his wife, Anne Morrow Lindbergh, wrote Gift from the Sea . She described a simple life on the seashore and contrasted it with, in her words, "the curtain of mechanization [coming] down between the mind and the hand." He read that as an accurate criticism of the life he had spent pushing the machine ahead of its human users. After that, Lindbergh became less visible. Now he worked with a quiet intensity trying to implement sane environmental policies. He pushed for the creation of the Congressional Office of Technological Assessment. He fought for the survival of that Tasaday tribe. At the end, Charles Lindbergh was still doing, with a complex life, what most of us stop doing in our later years. At the end he was still struggling -- to get it right. I'm John Lienhard at the University of Houston, where we're interested in the way inventive minds work. Reich, L.S., From the Spirit of St. Louis to the SST: Charles Lindbergh, Technology, and Environment. Technology and Culture , April 1995, Vol. 36, No. 2, pp. 351-393. Science, freedom, beauty, adventure: what more could you ask of life? There was science in each curve of an airfoil, in each angle between strut and wire, in the gap of a spark plug or the color of the exhaust flame. There was freedom in the unlimited horizon, on the open fields where one landed. A pilot was surrounded by beauty of earth and sky ... I began to feel that I lived on a higher plane than [those] on the ground; one that was richer because of its very association with the element of danger they dreaded, because it was freer of the earth to which they were bound. Lying under an acacia tree [in East Africa] with the sounds of dawn around me, I realized ... that the construction of an airplane, for instance, is simple when compared to the evolutionary achievement of a bird; that airplanes depend on an advanced civilization; and that where civilization is most advanced, few birds exit. I realized that if I had to choose, I would rather have birds than airplanes ... Civilization is progress and aviation a boon only if life improves because of them ... [T]he final answer will be given not by our amassment of knowledge, or by the discoveries of our science, or by the speed of our aircraft, but by the effect our civilized activities as a whole have upon the quality of our planet's life -- the life of plants and animals as well as that of man. For more on Charles Lindbergh, see Episode 318.